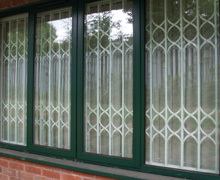 We can supply and install external or internal retractable security grilles for windows or doors and retractable security gates to protect your home or business premises. Our security grilles and retractable gates are designed for standard to higher security domestic and selected commercial applications and insurance approved high security applications using tested and certified grilles ('1001 series'). 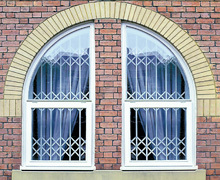 You can view the prices for these on our security grilles prices page. They are supplied in white or black as standard, however they can be powder coated in a variety of coloured finishes as an optional extra. You can view the full range of RAL colours here. 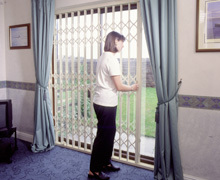 For windows in domestic situations the griles and retractable gates can be completely concealed behind curtains when open. The window barriers are supplied in two widths and five heights and can be used in a double sash format which doubles the width options. The high grade galvanised steel comes in an 'X' lattice as standard but can have an 'S' lattice as an optional extra. Designed to keep intruders out while letting the maximum amount of light in, our retractable security grilles and retractable gates are suprisingly unobtrusive. In a home they can be fitted to the door or window surround and disappear neatly behind curtains and a pelmet can conceal the top track. 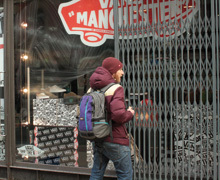 In retail situations security grilles are aesthetically pleasing but allow merchandise to be displayed safely 24 hours a day. sliding grilles concertina gates and grilles and window grilles based near Reading in Berkshire for DIY installation or fully fitted installation service throughout UK.